Howdy - recently found transmission fluid all over the underbody, and even a bit on the side of the van after a recent drive. Took it in to a local shop and they said everything was in great shape with no leaks. They think the fluid just boiled over. Fortunately nothing was damaged - no burning smell or black fluid. For now I had them do a flush and had them replace the fluid with Amsoil brand and also replace the filter. They seem to think better quality fluid will be a big help but I'm a bit nervous. I asked about moving the transmission cooler to a better location and they didn't seem to think there was a great spot to move it. They suggested seeing if I could find a different grill since they think the ford emblem blocks a lot of the airflow to the transmission cooler. Should I find someone to move the cooler? Should I find a different grill? Some additional info: I do have an aluminess bumper and also live in a pretty hot climate and occasionally like to tow a boat up big hills. Yes, big bumper combined with stock grill and transmission cooler and towing up hills can make it get too hot. Do yourself a favor, and add a Trans Temp gauge (or use a ScanGauge) and replace the OEM cooler with a TruCool Max 40,000# cooler. If you add that cooler, the bumper and grill doesn't matter anymore. Wish i could offer some constructive advise, but I'm not qualified. Did just experience pretty much the same. I have a scan gauge to monitor temps - Transmission usually runs around 168-175 (normal driving & not towing, also have the Aliminess bumper which restricts air flow), but last week for two days straight my temp hit 201. Concerned me as well, so brought it to Ford and their response was "it's within operating temperatures", which didnt easy my anxiety about the sudden spike. I too had the fluid & filter changed, and they said everything looks good inside - now my temps are back to normal ??? So now i'm also curious what response you get from the talent here. Thanks for the info, I'll look into those. I haven't done a lot of mechanical but I'm pretty good with my hands when I have the right tools. Is replacing the OEM cooler a fairly simple job? I have a scan gauge to monitor temps - Transmission usually runs around 168-175 (normal driving & not towing, also have the Aliminess bumper which restricts air flow), but last week for two days straight my temp hit 201. .
201F is well within normal. I wouldn't even start to worry until it hits 230F on the TorqueShift, and even then, if can go higher for short bursts. It's pretty straightforward. Somebody on here a few years back posted a DIY on this exact upgrade, but I don't remember who, or what good search terms would be. It's not quite a direct fit, but pretty close. I trimmed out one of the stock cooler supports, and mostly mounted it in the same spot, but offset to one side (so I didn't have to trim both supports), and bolted it to the radiator support top and outside bottom, and and the inner-lower tab to the remaining cooler support. Making the fittings work takes a little mixing and matching at your local Napa, since I don't think the ones they include work. Also, skip the temp bypass. The TorqueShift already has one, and the TrueCool version doesn't work well. Will certainly pursue the TruCool suggestion in any case. Crawpappy, your thread was great timing for me - Hope you get peace of mind with your issue. Thanks. 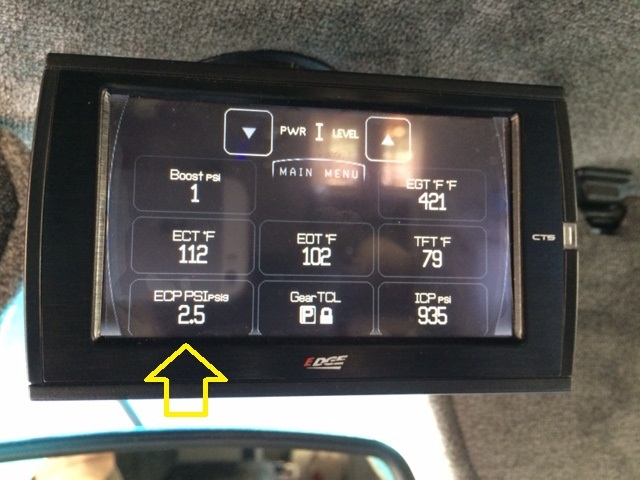 I'd love to be able to monitor trans temp but unfortunately my Edge CTS doesn't seem to have that as an option. Does the ScanGuage 2 have that feature by default? I'd love to be able to monitor trans temp but unfortunately my Edge CTS doesn't seem to have that as an option. That's odd. On mine TFT in the pic, not the arrow, is Transmission Fluid Temperature. Maybe a different year van or ECU. Yeah, something is weird with my EDGE. I go to add new PID and TFT isn't an option. Neither is EOT, which is also a bummer. I had the guys at a shop that installs them one time look at it when it was in for something else and they couldn't figure it out either.